When the world is just too much, a full dose of dharma humor can be the cure. But harsh realities still demand a voice, so we split this issue between gravitas and levitas, ending up—surprise, surprise—on the middle path. 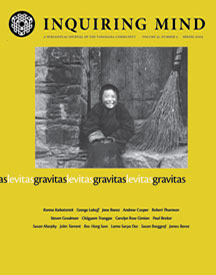 Cover art: Jon Kaplan, “Girl with Broom, Lhasa, Tibet (near Johkang temple),” 1998. Photograph. Wes Nisker gives an overview and context for this issue, explaining that while working on our “humor” issue, there was a presidential election . . . and then a deadly tsunami. So we invite you to laugh and cry with us. Psychotherapist Ronna Kabatznick was on retreat in Thailand when the tsunami struck. She quickly went to the disaster area to help survivors face what the Buddha described as the inevitable realities of life: sorrow, grief, pain, lamentation and despair. Her account takes us into the heart of the tragedy. Best-selling author and linguistics professor George Lakoff explains how language and current consciousness research can help us understand our political dilemmas and communicate our truths. Jane Baraz encourages Buddhist communities to become sanctuaries for conscientious objectors. What would the sutras be like if, instead of Ananda, they were recounted by someone like Sam Spade or Philip Marlowe? Andy Cooper channels a Dashiell Hammett take on the Buddha. Renowned scholar and raconteur Robert Thurman finds magic and delight in Buddhist texts. Professor of Asian studies Steven Goodman, known for his verbal brilliance and great sense of humor, regales us with tales of tantric tricksters. John Tarrant talks about the playfulness of Zen and, in particular, the koan. Reverend Heng Sure of the Berkeley Buddhist Monastery finds hilarity on a pilgrimage and jokes about the healing power of Buddhist humor. Barbara Gates gives her dog a bath as a last rite. Susan Burrgraf offers a provocative invitation to Buddhists to celebrate the holidays of the Roman calendar. With a foreward by Kidder Smith. In poetic form, Mike Dickman translates a text that Kyabje Künzang Dechen Lingpa wrote as an instruction to one of his disciples. With wit and wisdom, drawing from the Tibetan literary tradition and teaching vehicle known as “Jay-kul” (self-admonishment), Lama Surya Das reflects upon his faults. Vipassana teacher James Baraz penned this issue’s practice page with an appeal for joy. With his usual crazy wisdom, Wes Nisker suggests that the best thing for all humanity would be to celebrate our foolishness.